Let’s turn back the clock to around the year “Titanic” came out (1997). 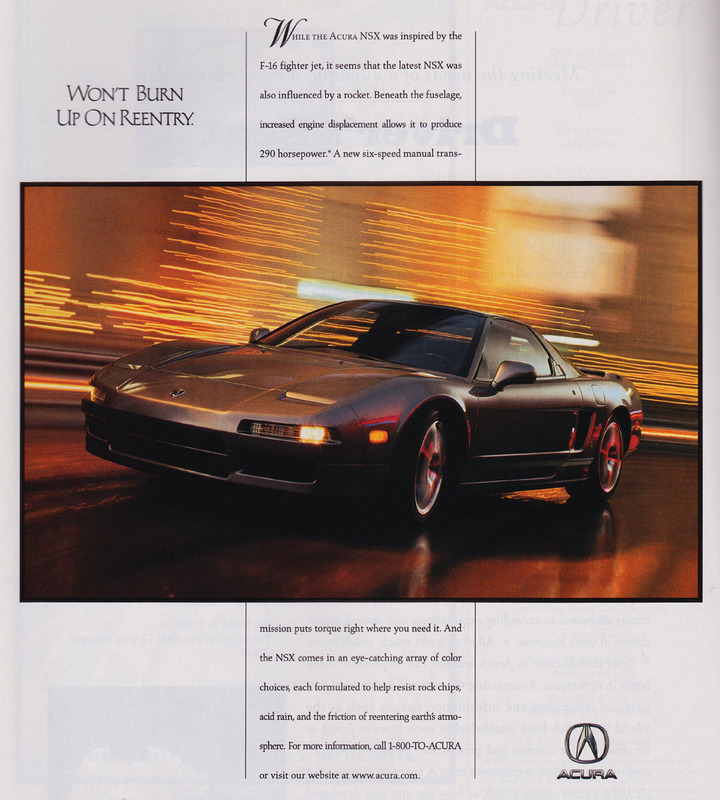 I was one of the lucky few to be a subscriber to Acura Driver magazine (now “Style”) in the late 1990’s. I recently started digging into the archives and found a few hidden treasures that I wanted to share. 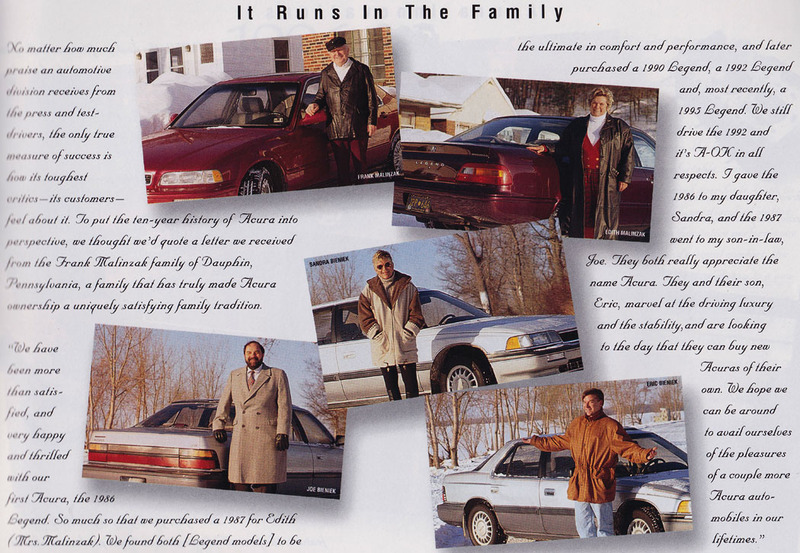 Acura always tried really hard to highlight individuals or families who had a strong commitment to the brand, like this family with a bunch of Legends. I spy a rare 1995 Garnet Red sedan with the gold emblem package! 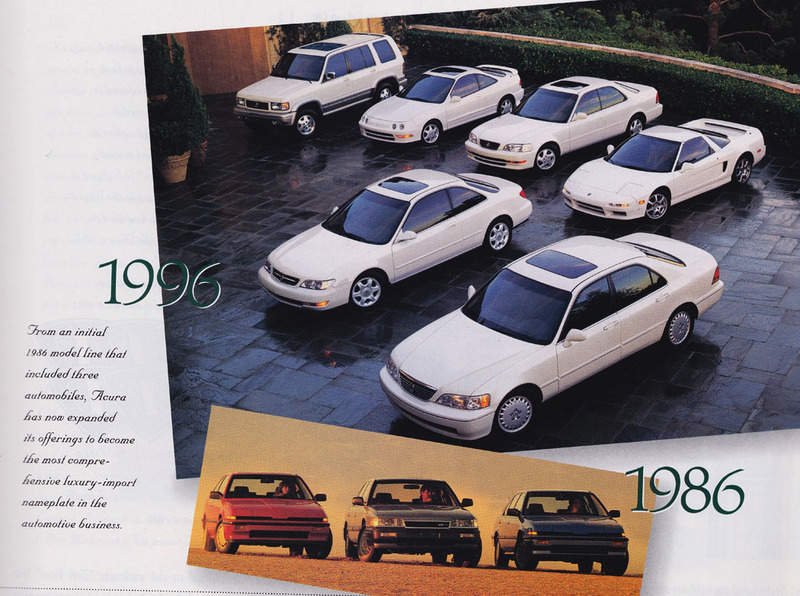 This photo feature was published in commemoration of the brand’s 10-year anniversary in 1996. How different does the lineup look today? Gone are the two-door models like the Integra, CL, and NSX. In fact, every single model from this picture has been renamed or discontinued entirely. 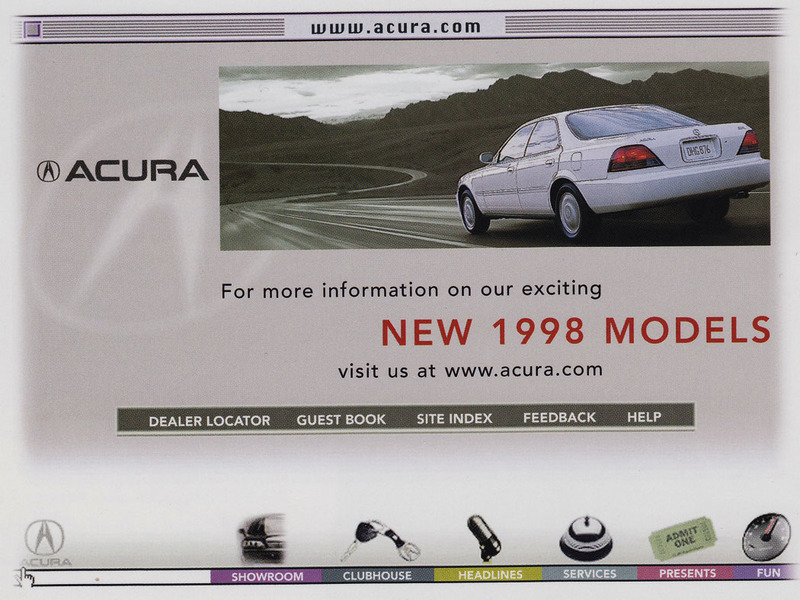 Had to laugh at this one – below is a look at what the http://www.acura.com website looked like in late 1997 – early 1998. Today’s interactive and elaborate webpages blow this one out of the water. 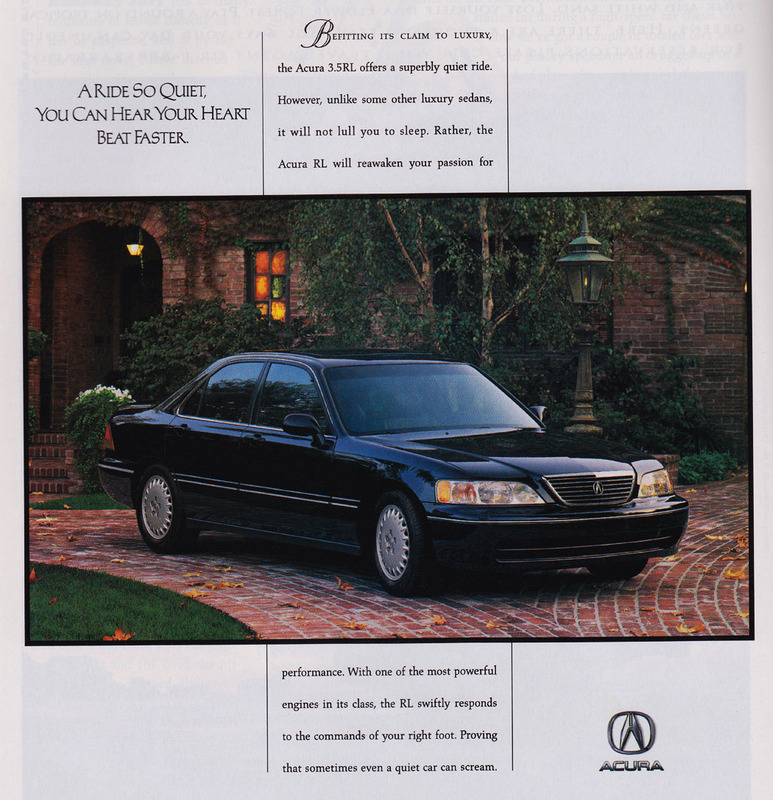 In each Acura Driver issue, then-Vice President Richard Thomas shared a letter to the Acura community that was followed by a photo of him with an Acura. 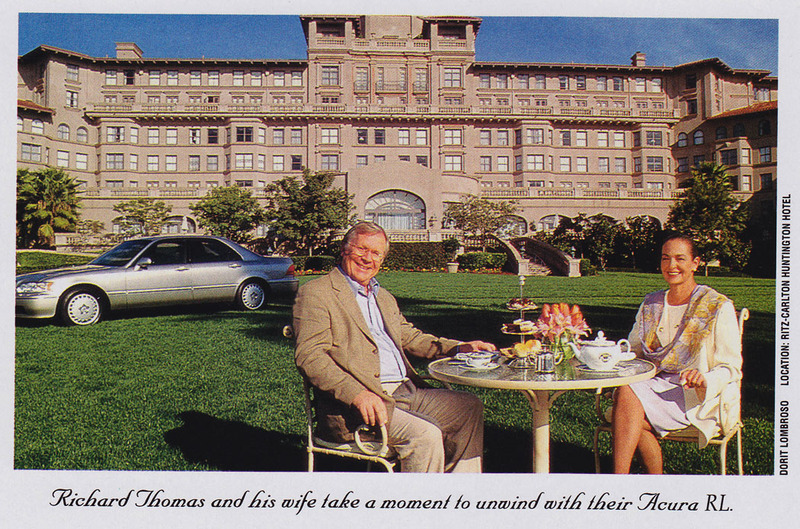 This was one example, taken with a Heather Mist Metallic 1996 3.5 RL on the lawn of the Ritz Carlton. Posh. Pardon me, does anyone have any Grey Poupon? 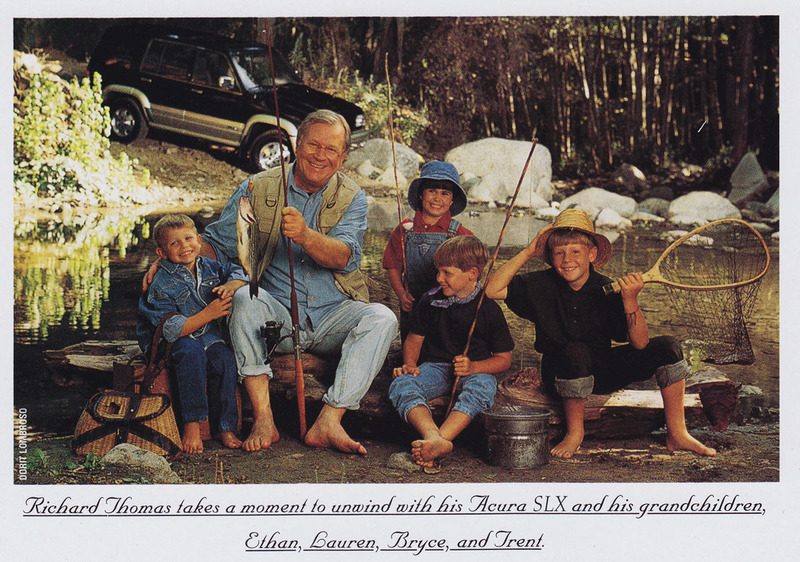 And this one with his grandkids while on an outdoors excursion in a 1996 SLX. Technology sure has come a long way, too. Below was a sketch of what was on the horizon for the world of satellite-based GPS navigation systems. 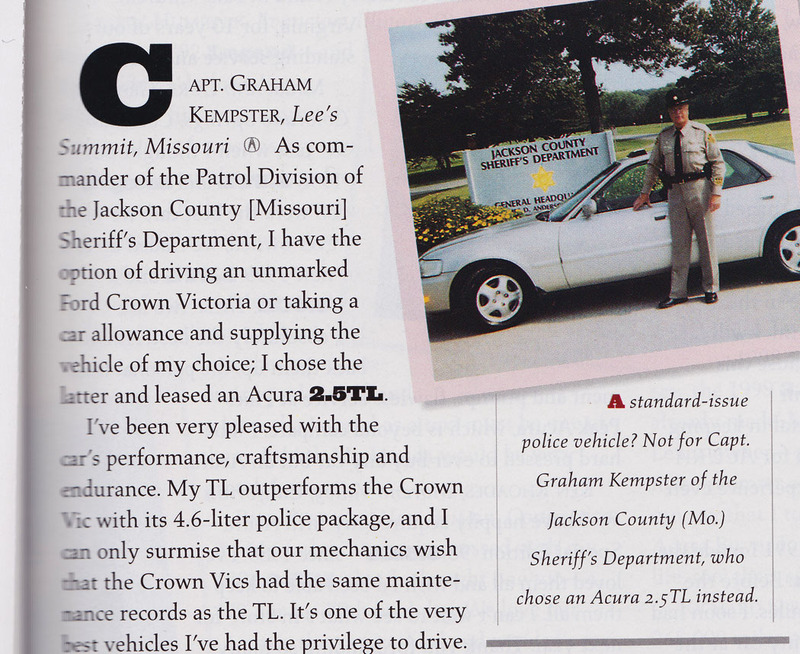 I especially loved this story of a sheriff in Jackson County, Missouri who used a 2.5 TL as his unmarked patrol car. “My TL outperforms the Crown Vic with its 4.6 liter police package,” he said. That’s impressive considering his TL had only 5 cylinders! 3.5 RL advertisement. “A Ride So Quiet, You Can Hear Your Heart Beat Faster.” Ha! Good stuff! 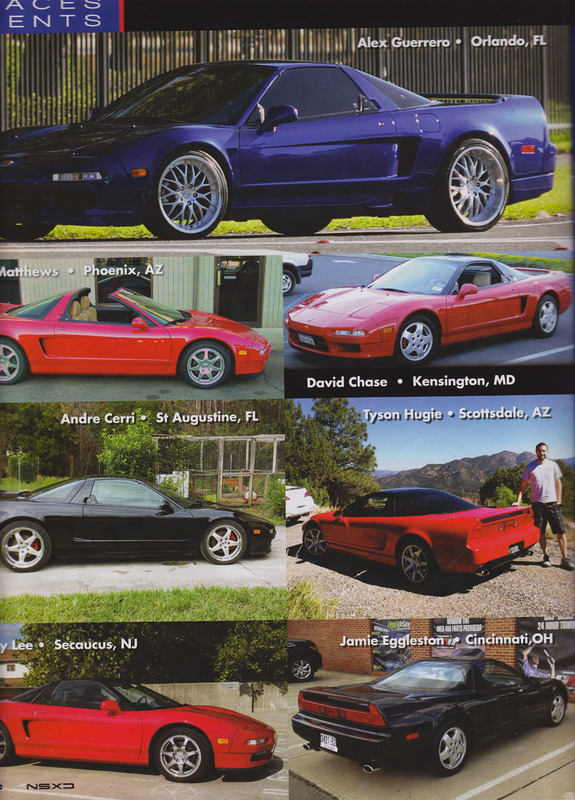 Speaking of Acura magazines, somehow I made it into the latest NSX Driver. 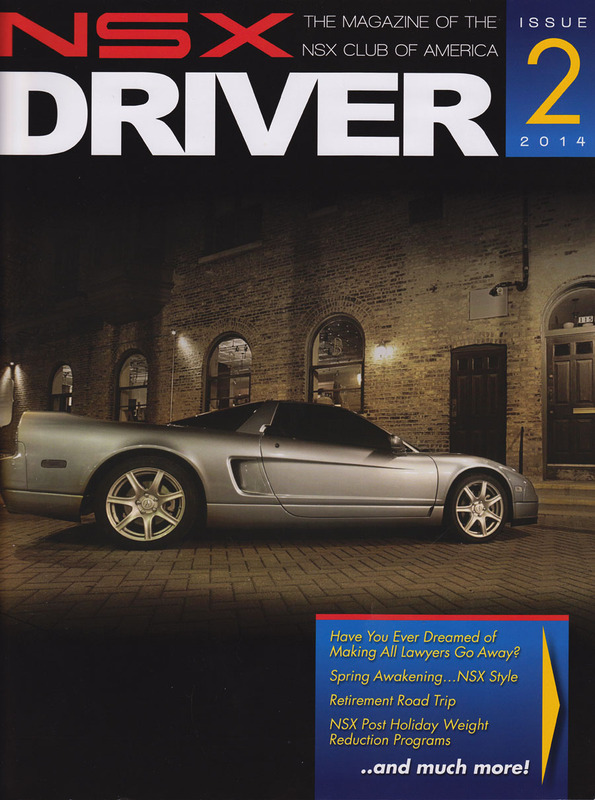 It’s a publication of the NSXCA (NSX Club of America). In each issue, the magazine features members who are new to the NSXCA. The of mine that they included was from a trip to Coronado Trail in eastern Arizona a couple of years ago. Finally, I’m sending a shout-out to Jason from Driven for Drives as he continues his cross-country tour. He sent me this picture of a meet-up with my friend Sofyan in Washington, DC a couple of days ago. Nice looking Fathom Blue ILX and Crystal Black TL! You guys are making me want to hit the highway for some travels of my own. Stay tuned! This entry was posted on May 29, 2014 at 6:05 am and is filed under Brochures, Throwback. You can follow any responses to this entry through the RSS 2.0 feed. You can leave a response, or trackback from your own site. 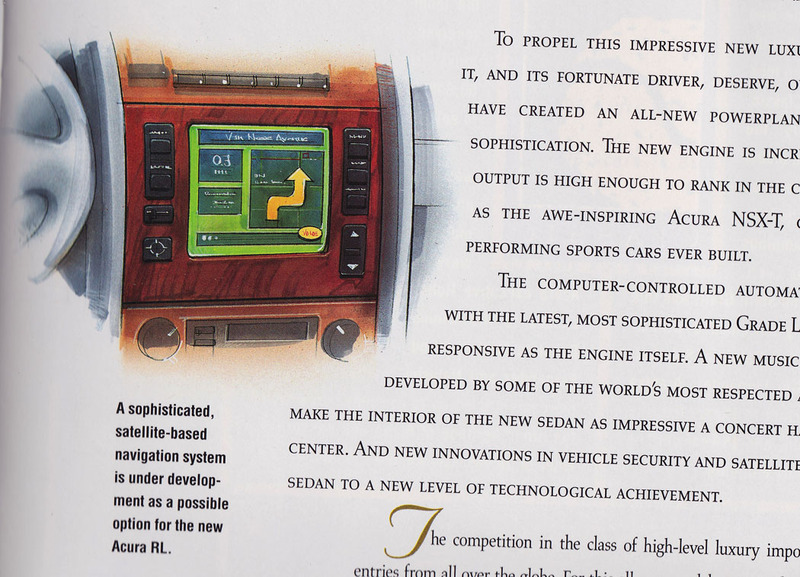 I wish I could get a hold of all that early 90s Acura literature. It’s crazy of me to hang onto all these old items but I can’t bring myself to throw them away! Glad someone else can appreciate the scans.